2017 has been a stressful year, and especially I have just finished my finals (I haven't been posting for a while if you can tell), I decided to treat myself a little better and be my own Santa Claus. This time of the year, money goes away easily because of all the presents you have to shop; I am the kind of person that does not stop buying once I have started Christmas shopping, for myself and others. I love getting presents for those I love, I tend to buy more presents for my friends and family than for myself. So this year, I am changing the game a little bit to buy myself more presents. The set includes 4 items: body cream, body scrub, shower oil and hand cream. I have heard about their body scrub for many times but never really get the chance to try it. Now that I have the chance, I need to say that their scrub is the best scrub I have ever used. The scrub uses sea salt and aroma oil, which can effectively remove dead skin and dark areas, it also leaves the skin smooth and hydrated to the point I do not have to put on body cream (my skin is usually really dry). Each scrub also comes with a mini wooden spoon to mix the salt and the aroma oil together before you use it. The scent of Jasmine in the products is amazing, it has a feeling of relaxing and calming. I would definitely purchase more body products from them again for pampering. I have to say I am surprised they have facemask provided, but it is one of the best masks I have ever used. I chose a moisturizing facemask and a deep-cleansing mud mask. The moisturizing facemask is really effective, with a creamy texture. My skin absorbs the mask really quick, and I can instantly feel my skin being pumped up with water and moisture. For the deep-cleansing mask, I would say it is a bit dry for people with dry skin, but the cleansing part is really effective. I can definitely see my pores are being cleaned, as well as my skin has been brightened up a lot, but I suggest using this with the moisturizing mask afterward. This is one of my dream-bags, I admit I had a lot of struggle before I bought it. I was struggling with this bag or the Gucci Marmont, and I was struggling to save up for it as well. But eventually, I bought this because it looks classier to me and goes along better with my outfits. The money is well-spent, though it is tough to save up for a luxury bag, I really love how it fits all my outfits. The bag has a lot of card slots in it, with a zip area to put your money and coins, it is also divided into 2 parts so things could be more organized. The strap length is adjustable as well, but I love how the strap is detachable so I could use this bag as a clutch as well. I have been searching for an envelope wallet for a long time until now, I finally found it. I was originally using a wallet from fossil, but then it was really thick, so I switched it for an envelope wallet I bought from a handcraft market in Thailand (I know it is a huge contrast). Now that I wanted to change a new wallet, I have been having a hard time to find a similar one. This Prada envelope wallet is exactly what I was looking for, it is thin with soft leather, with 6 card slots embedded inside the wallet. It also has an external card holder with a coin pouch so I could take it out when I only need to use cards instead of the whole wallet. Richmond & Finch is one of my favorite phone case brands, they have simple and beautiful designs which I cannot take my eyes off them. So I finally decided to purchase their cherry blush phone case. It is pink in color with cherry blossom as background, it also has this rosegold metal plate down below the case which adds more details to the design. The surface of the case is really smooth like satin, the case is also really protective. 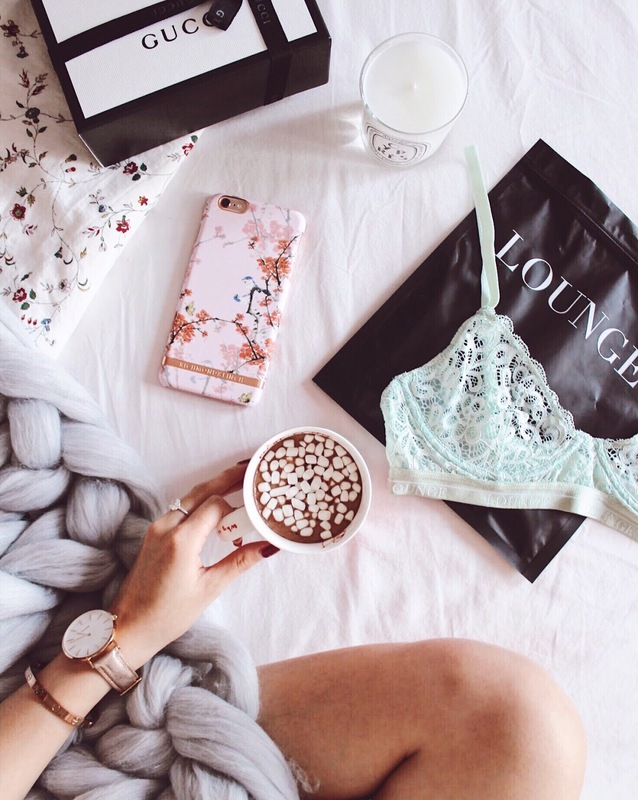 Lounge Underwear has been all over Instagram for a while, so I decided to get a set for myself as well, as I am more of a bralette person than a bra person. I got their lace balcony in mint color, they are wired underneath so it gives the support your breasts need for daily activities without suffocating them (there are no pads, just lace). The material was pretty good, but overall, the design is just appealing. What do you think of my Christmas presents I bought for myself? Tell me about what you got for Christmas as well, I would love to know!